Battery Type: 3 x 1.5 V/approx. 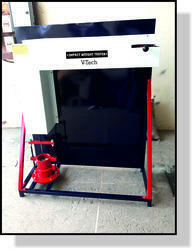 Power (Kw): 3 Phase, 440 V, 50 Hz, A.C.
- To conduct fracture toughness test as per ASTM-E-208. - Energies are 350, 400, 450, 550, 800, 1100, 1350, 1650 J. Our Drop Weight Impact Tester are designed for measuring the impact performance of raw material specimens and finished components. Drop tower are used for testing a wide variety of plastic, metal, and composite materials. Our range of drop weight tear testers is procured from Imatek, UK. Imatek is well known for their expetise and high quality machines. They have supplied machines to research entities in India. They have supplied a 100, 000 J DWTT to Posco Steels South Korea. The HMP LFG 4 light drop weight tester also referred to as Light weight deflectometer or LWD is a portable dynamic impulse plate load tester based on accelerometer sensor used for determining the soil bearing capacity and compaction quality of soils and non-cohesive sub-bases.